This is a picture full of meanings – some obvious, some hidden. We can see two gentlemen; on the left is Jean de Dintville, whom the French King had sent on a diplomatic mission to the court of Henry VIII. 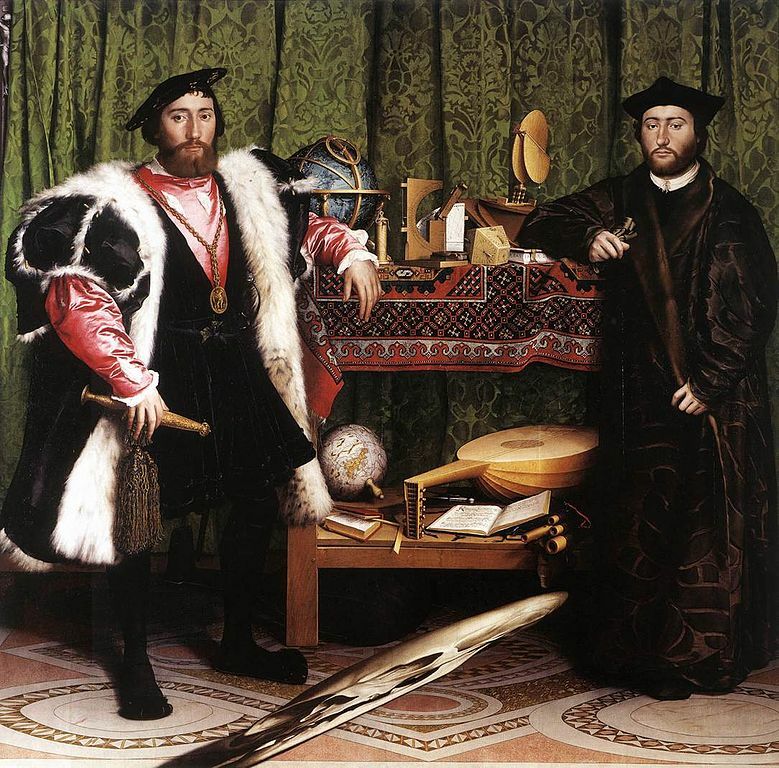 It was de Dintville who commissioned this painting to mark the visit to London of his friend Georges de Selves – the man on the right – in 1533. Between them are a couple of shelves with all manner of objects on them – globes, musical and scientific instruments, books. And on the floor is a curious black and white “smudge”, that doesn’t seem to belong to the painting at all. De Selves is the contemplative life – he was the Bishop of Lamaur and is more plainly dressed and less expansive, and he wears a scholar’s hat. His elbow rests on a book (which has his age on it – 25). By composing the two friends as he has, Holbein shows how the two facets of character – the active and the contemplative – balance and complement each other. The objects on the shelves have a similar purpose. They represent the interests of the two men and show the height of science and culture in the early 16th Century world. Here, Holbein might be saying, are the things important to the life of gentlemen. On the top shelf are objects to do with the heavens – there is a celestial globe and various navigational and astronomical instruments. On the bottom shelf is a book on mathematics, a hymn book, a lute and a case of recorders or flutes. Another interpretation is that this is a political message. At the time this was being painted Henry VIII was divorcing Katherine of Aragon and marrying Anne Boleyn, causing England to split with the Catholic church. If we look closely we can see one of the lute strings is broken (that’s the sort of very fine detail Holbein was able to achieve). Does this represent the schism? (The maths book is open on the section for “division” by the way.) The hymnal shows one of Martin Luther’s hymns; Luther was the figurehead of the new Protestant religion, so is Holbein’s message here that what unites is greater than what divides? Or is the message broader? Look to the top left of the picture and behind the beautiful green curtains you can just see Christ on the cross – and then we have the shape on the floor. This is actually a skull, its perspective skewed so that you can only see it properly when you’re standing to the right of the picture. It might be referring to the emblem of de Dintville – the medallion on his cap also has a skull device – but it is also a memento mori: a reminder of mortality, that life is fleeting and all our accomplishments ultimately mean nothing. This entry was posted in five minute presentations, National Gallery and tagged hans holbein on 24/06/2015 by donbrown.